Saturday, November 12, 2016. This morning members of General Congregation 36 voted to close the General Congregation. The day began with prayer as usual, but with a new twist for the final day of the Congregation. Fathers Mark Revizza and Pablo Alonso led the Congregation in a contemplative examination of the six weeks of work. Yesterday evening (November 11), the electors took time to evaluate the Congregation in Conference groups. This morning, they continued the evaluation was of a more spiritual nature and was done across mixed groups. The final evaluation of the Congregation will be completed with an on-line survey that delegates will participate in. In the final working session of GC36 in the Aula, after the vote necessary to decree the end of the Congregation, gratitude was expressed to several people who ensured the success of the Congregation. Father General led by thanking various committees [see his comments here] before the Secretary of the Congregation expressed gratitude to several more people. 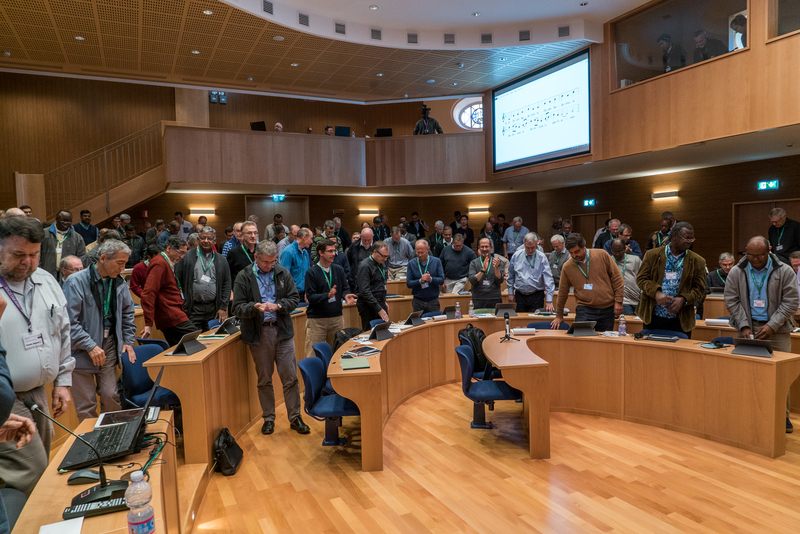 Father General Sosa thanked the Congregation for its work, relying on the text of Mark 4:26, emphasizing the importance of recognizing that it is the Lord who will grow the seed that the Congregation is planting today. He thanked all the people and teams involved in the process of preparation, coordination, logistics, communication, translation, staff of the curia … ending with a special thanks to the Jesuit communities of Rome that have so generously welcomed the members of the Congregation. The Secretary of the Congregation, Fr. Orlando Torres, also thanked all the commissions and teams that worked on the decrees, as well as the assistant secretaries and the rest of the Congregation’s coordination team. The closing session ended with the traditional Te Deum, sung with joy by all the delegates. The members of GC 36 will participate in a Thanksgiving Mass at Saint Ignatius Church this afternoon beginning at 16.00 (4.00 p.m.). It will be followed by a social evening at the Gregorian University.